February 17, 2015 – As NASA prepares to test the massive solid rocket booster for the agency’s Space Launch System (SLS) rocket in March, a team of engineers is looking even farther into the future by exploring an advanced composite that someday might be used to create even more powerful boosters. To understand how well these materials could withstand the immense strains of a launch, the engineers conducted a test that involved pressurizing a booster structure made of composite materials to its breaking point to see how it compares with the metallic booster cases currently used. In the case burst test, a booster case 25 feet long and 92 inches in diameter was subjected to 3,000 pounds per square inch of pressure — well beyond what would be encountered in flight conditions — to verify exactly what loads the composite material could withstand. Before the test, damage was purposefully caused at multiple points on the case to study what effect it would have on how the case fared. Even so, the damaged case performed as well as an intact case, demonstrating not only the composite case could withstand the rigors of launch, but that it could do so even in a damaged condition. The test was conducted by Orbital ATK of Promontory, Utah, which made the solid rocket boosters flown on the space shuttle and will provide the boosters for the first flights of SLS. During the test, the case failed within 1 percent of pretest estimates, validating the models for strength of the composites. One-hundred-twelve channels of instrumentation provided data on the case failure. The rocket motor case test is part of an effort to optimize a composite case design that may be stronger, lighter, yet more affordable than traditional steel cases. In turn, this would provide increased payload performance due to reduced weight inherent in composite materials. After the initial flights of SLS, the rocket will be upgraded from a configuration capable of delivering 70 metric tons (77 tons) to low-Earth orbit to an evolved configuration that will launch 130 metric tons (143 tons). To reach its full capability, SLS will use more powerful boosters. 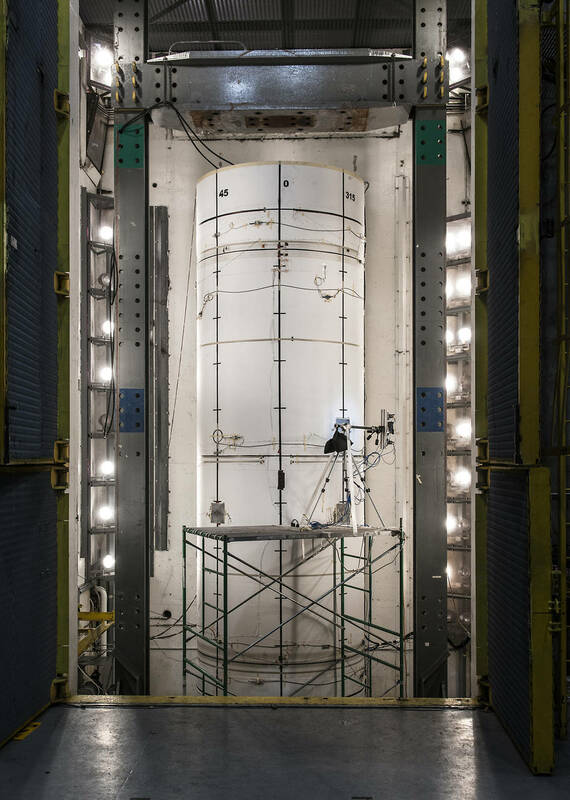 NASA is preparing today for that evolution by working with industry partners to test technologies that could be used to develop new liquid or solid rocket boosters. The SLS will be NASA’s first exploration-class vehicle since the Saturn V took American astronauts to the moon more than 40 years ago and will expand our reach in the solar system, launching crews of up to four astronauts aboard the Lockheed Martin-built Orion spacecraft to explore multiple, deep space destinations. too large to fly on commercial rockets.